1. Outside Pavilion mall. 2. Central Market in KL. 3. At the Kasturi Walk. 4. Guan Di Temple in Chinatown. 5. 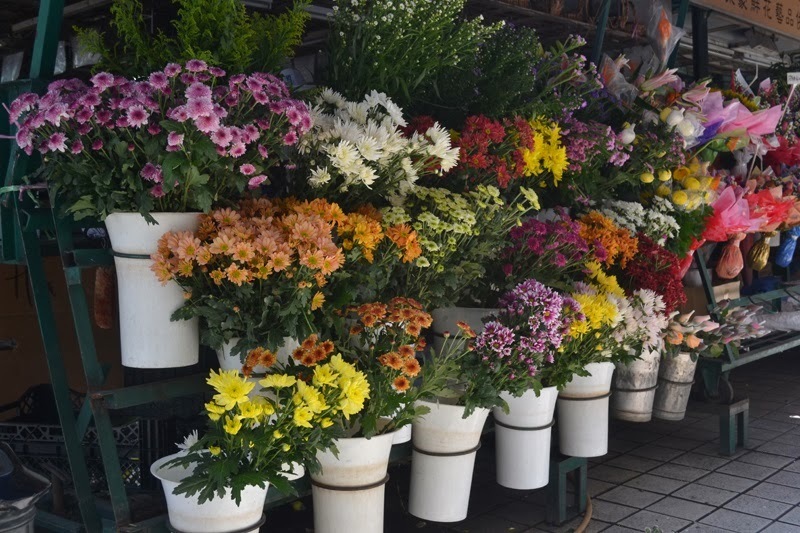 Fresh flowers along Chinatown. The weather in Kuala Lumpur is insanely humid, which explains the cropped top and short skirt outfit. Even though I'm from a tropical country and I'm used to living in a warm environment, being out and about in 33°C called for breezy and light-weight fabrics. 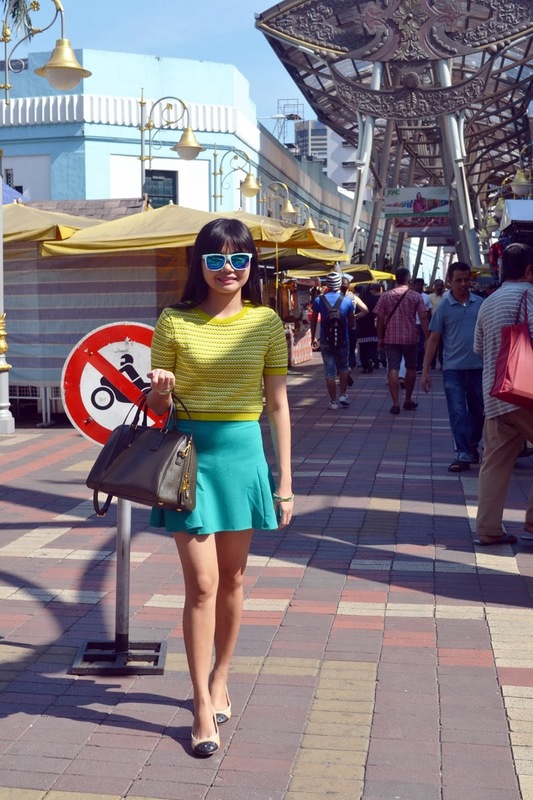 We spent another day doing more sight-seeing along Jalan Hang Kasturi and Bukit Bintang. 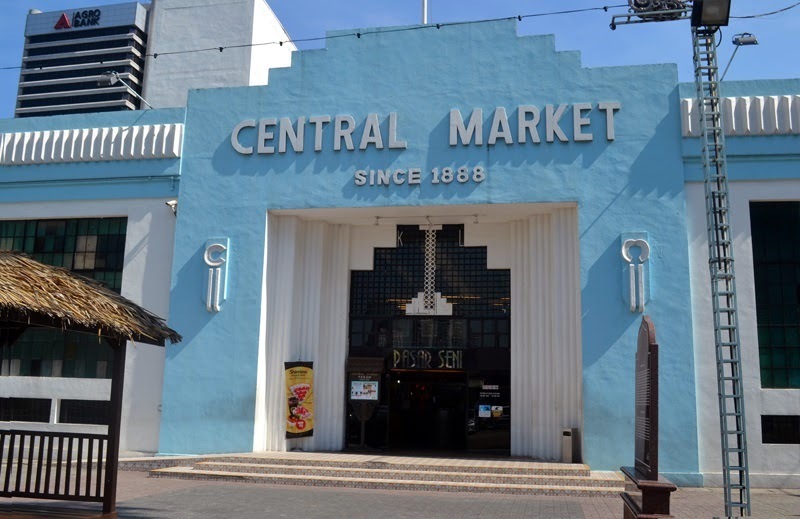 If you're looking for locally made products, handicrafts and other gift items, you might want to check out Central Market. It used to be a wet market but is now the centre for Malaysian Culture, Heritage, and Arts & Crafts. You can find a number of shops offering trinkets, textiles, sarongs, traditional clothing, etc. Adjacent to the market is Kasturi Walk, an outdoor and covered pedestrianized lane that adds a vibrant al fresco ambiance to your shopping experience. You can find food kiosks as well as stalls selling clothes, jewellery and souvenirs. Don't forget to drop by a shop called, "Easia." Aside from apparel, they also sell a variety of necklaces, bracelets and other accessories at amazing prices. I was able to purchase this pretty neck piece for only RM 10! Just up the road is Chinatown where the famous Guan Di Temple is located. Walking along Chinatown was kind of disappointing as I was hoping to see authentic Chinese goods but sadly the majority of stalls only sell counterfeit items. But because it's in close proximity to the other two locations, it's worth checking out. We then proceeded back to Pavilion mall in Bukit Bintang and had lunch at an Irish pub before crossing the road to Starhill Gallery, a luxury retail mall which houses designer brands such as Valentino, Louis Vuitton and Dior amongst others. You can read about my previous post, Exploring Kuala Lumpur Part 1 here.